Sceneries that are sure to leave a lasting impression – breathtaking autumn-leaf viewing spots offered by Shikoku. Iya-kei Gorge in Miyoshi-shi, Tokushima prefecture, is a gorge formed by Iya River dissecting the Shikoku Mountains. The panorama of autumn leaves, covering the entire surface, from the bottom of the valley to the mountain peaks is extraordinary. There is a great cliff called Shoben Iwa along the valley side-slopes and the outlook from this area is fascinating. Kazura-bashi Bridge has a tragic story of the Taira clan, but the autumn leaves visible from the bridge is one of the best on the island. The leaves change colors from mid-November until November-end. Kanka-kei Gorge, situated in Shodoshima-cho, Shodo-gun, Kagawa prefecture, is one of the three most beautiful gorges in Japan, and is a popular place reknowned for its scenic beauty in Japan. 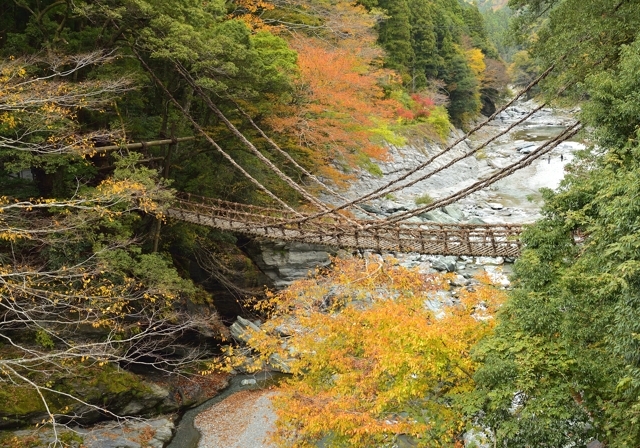 There is a ropeway that moves high over the trees in the deep gorge and attracting tourists during Autumn. The birds-eye view of autumn leaves from this ropeway is breathtaking. Leaves start changing their color from mid-November to until November-end. Kuroson-Keikoku Gorge is situated in Shimanto-shi of Kochi prefecture. There are many old-growth beech forests, up-stream of Kurosan River, which is the clearest tributary of the Shimanto River. The reflection of the autumn-leaves over the surface of the clear running stream provides a surreal experience. Kuroson River is so clear and beautiful that it was selected as one of the 100 best water of Heisei back in 2012. The picture depicts the contrast created by the autumn leaves and the river. Pleasing sceneries are offered this Autumn by each of the four prefectures on Shikoku Island. If you have already visited the island during other seasons, you definitely should plan a visit during the autumn-leaf viewing season. Your visit guarantees you a memorable Autumn this year. 10 Best Autumn-leaf Viewing Spots in Tohoku!